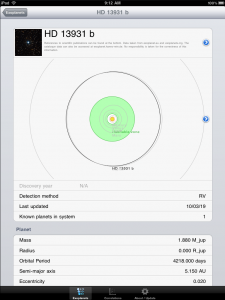 An update of the Exoplanet App for iPhone/iPod has hit the AppStore. I now features an illustration of the orbits in a planetary systems with an estimate of the habitable zone. Furthermore, native iPad support has been included. Update: A new feature “SkyView” lets you see the position of all exoplanets on a sky chart.